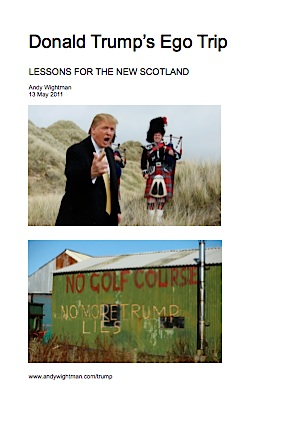 This page contains information about my report on Donald Trump’s golf course development at Menie Estate in Aberdeenshire together with other useful resources. Please also see all the blog posts on the topic which contain a lot of further information. Video of the background to report. Planning consents for Menie Estate – go to Aberdeenshire Council website and type “Menie” in <site address> field or “dundas” in <agent> field. There are 3 pages of applications. The approved masterplan is here. The stunning new documentary by Anthony Baxter and Richard Phinney.